This was the first film that Ozu Yasujiro was able to make for five years (he was stationed in Singapore from 1943-5) and it was made on a shoestring at Shochiku’s Ofuna Studio in Kamakura, the ancient city South-West of Tokyo where Ozu lived and died. According to David Bordwell the film was scripted in just 12 days and the final cut lasted only 72 mins – it was after all a very difficult time in Japan. The story is very simple. One of a group of people living in a clutch of houses amidst the rubble of Tokyo comes home one day with a small boy in tow. All the local residents have temporary jobs that reflect a struggle to make ends meet in this period of post-war reconstruction – yet there are also ‘new’ characters such as the smart young niece of one of the men. The boy appears to have been abandoned by his father in the city and Tashiro (Ryu Chisu) has taken pity on him. But Tashiro doesn’t want to look after the boy himself and he tries first to unload him on his neighbour Tamekichi and when he refuses, on the widow Tane. She doesn’t want to look after the boy either but she lets him stay the night. Over the next week the reluctant Tane comes to accept the boy. That’s about it really as far as the narrative goes. There are incidents and there’s an ending, but the film is about the characters and the social situation rather than the narrative structure. This is why I think that neo-realism is a valid reference. The situation in Tokyo was similar (worse probably) than in Rome or Berlin. Perhaps the Japanese were fortunate in not having so many ‘displaced persons’ (although there were Korean and Chinese migrants in Japan under the Occupation Authority). Like the neo-realists, Ozu was working with a familiar daily occurrence and seeing what it allowed him to explore in communities. 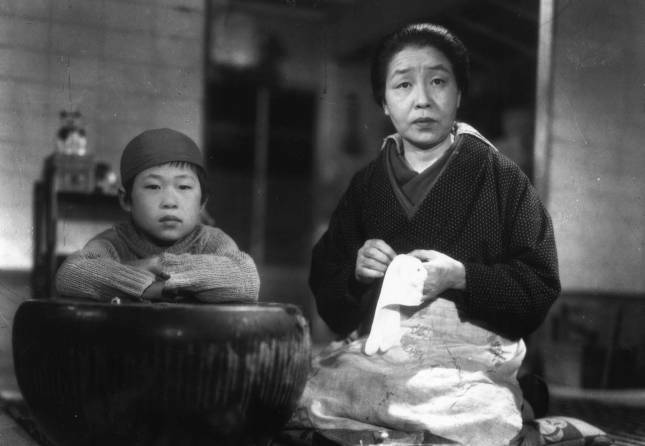 May 1947 was too early for Ozu to have seen Bicycle Thieves or Germany Year Zero – or indeed any of the German ‘rubble films’ of the postwar period. But there are similarities in the situation and his approach. Although most of the film is studio bound, there are significant location-shot scenes. There are studio sets and these are studio actors, but still there is a sense in which this is a ‘story from the streets’ (rather than a literary adaptation like many of Ozu’s later films). It’s worth remembering also that the Occupation Authorities were supportive of some themes while they banned others. A story about a widow in the ‘new Japan’ was probably very acceptable in a climate of support for women’s rights. I’m beginning to realise, as I watch more of Ozu, that most critics are too keen to ‘sectionalise’ the director’s output – as if he stopped making one kind of film and then started something else. He didn’t of course. There is a gradual accretion of stylistic devices and although there are shifts in thematics, there are also threads running through the whole body of work. For instance, I understand that there was reference to the difficult social realities of contemporary Japan in the 1930s films. In this sense, Record of a Tenement Gentleman is a continuation rather than a new beginning. The comic tone that lies on top of the sentimentality in the film is also a recurring element and the focus on the boy picks up on earlier films and is repeated in cameo appearances in Late Spring (1949) and is very evident in Ohayo! (1959). I see no real reason to separate this film from those that followed in the so-called ‘late period’ of 1949-62. I haven’t watched all of the later yet, but I’m sure that I will find them both similar and different, but consistent – if that makes sense. This entry was posted in Japanese Cinema and tagged neo-realism, Ozu. Bookmark the permalink.